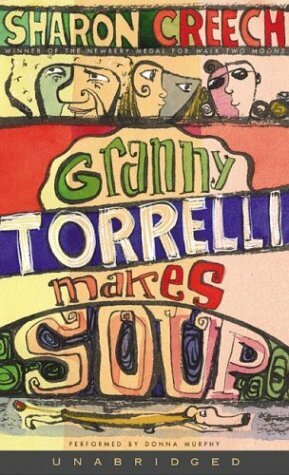 Years ago, my dear friend Gaby gave me a copy of Sharon Creech’s Granny Torrelli Makes Soup and, for some reason or another, I just never got around to reading it. Well, shame on me, because last night around 11pm, when i finally turned the last page of this remarkable book, i immediately added it to my list of absolute favorites. It is a stunning, beautiful, heartbreaking tale of the friendship between 12-year-old Rosie and her best friend, a very handsome and vision impaired boy named Bailey. For anyone who has ever had a best friend…for anyone who has ever felt those first stirrings of love and friendship all mixed together and for anyone who absolutely adores their grandmother, this is the book for you. Granny Torrelli is the heroine of this book – the no-nonsense Italian grandmother who solves all of the world’s problems with a little garlic and a whole lot of love. This chapter book is most appropriate for children ages 8 and up, and yet it speaks perfectly beautifully to adults as well. A complete and utter treasure of a book from a treasured friend.